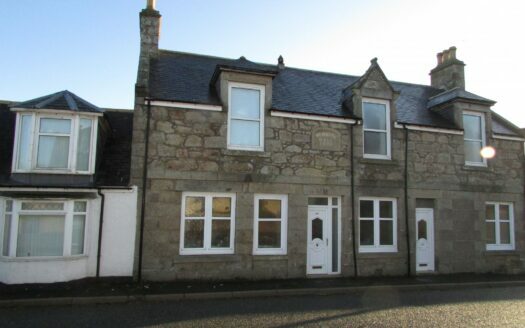 LOOKING AT SETTING FOOT ONTO THE PROPERTY MARKET, OR EXPANDING YOUR RENTAL PORTFOLIO?…………….. Then look no further, 67 Union Grove, Fraserburgh is a delightful mid-terraced two bedroomed house that is sure to ‘tick’ all your boxes! The current proprietors have tastefully decorated the house throughout, and have recently replaced the hallway and staircase carpet. Union Grove is situated a short walking distance from the town centre. Close-by are both primary & secondary school’s, doctors surgery and hospital, convenience stores as well as take-aways. 67 Union Grove benefits from UPVC woodgrain effect double glazing and gas central heating to individual radiators throughout. To the front of the property is a driveway for off-road parking. There is a ‘shared’ penny lane that leads to the rear garden. The rear garden is fully enclosed, has a large area in lawn with patio and wooden shed to the rear. The living room benefits from a bay window to the front, and a feature of this room is the fireplace where the baxi boiler is located behind the fire. Door leads through to the kitchen which is fitted with a range of wooden wall mounted and base level units and space for appliances. All appliances are INCLUDED in the sale! There is a breakfast bar table that provides comfortable seating. Upstairs are the two bedrooms, box room and shower room. Both bedrooms benefit from built-in wardrobe storage which provides ample hanging rail space and shelving. The box room has built-in mirror doored wardrobes and could be put to multiple usage such as dressing room, nursery, office etc. The shower room is fitted with a white suite and new vinyl flooring. 67 Union Grove is well worth viewing to appreciate the scale of accommodation on offer!